Sometimes it just takes some Tender Loving Care to get a synth fixed. 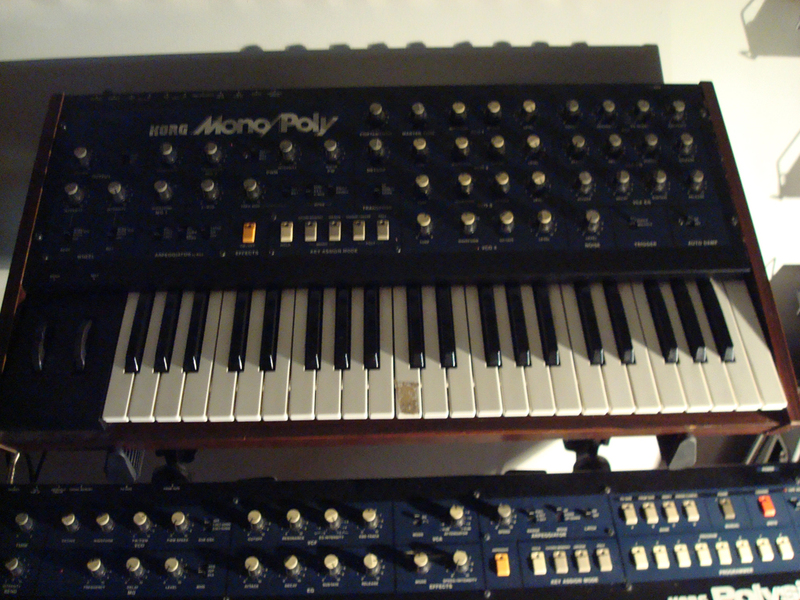 Just yesterday I told you how anxious I was to get my hands on a Korg Mono/Poly. But they’re quite rare beasts, until now I had never even seen one live before. Earlier this week, I had the pleasure of meeting my old friend Benny from art school who studied production at the same time as I studied animation. He told me that he had saved a synthesizer from a pile of crap in his old workplace and it had been destined to go to the local landfill. Benny had taken it home and fired it up, but there had been no sound at all. After a short talk it occured to me that the synth Benny had on his hands was no other than Korg Mono/Poly, one of the holy grails of my synth-collecting. He told me that he and a friend of his had tried to fix the Mono/Poly, but with little success. As I had a roomfull of synths and a reputation to get broken synths working again, he gave it to me for a long time lease. I could have it with me and play it if I could get it fixed. Tonight at 19:00 I finally got my hands on the beast. On the surface it looked really really good. No bumps, all the knobs were there, the wooden cheeks completely intact. Only a thick layer of dust and dirt told me that it was a 30 year old synth. At 21:00 the Mono/Poly was already up and running and making beautiful sounds. On first test there was no sound at all so I did what I usually do in a situation like this. I took the whole synth apart, put all the knobs in a tub of hot soapy water and started cleaning the insides of the synth. I used q-tips and compressed air on the delicate parts and a bottle of PRF 78-7 to lubricate and clean the potentiometers and switches. I went through the whole synth part by part and after that I cleaned the knobs that had been in the bath with a used toothbrush. After a thorough cleaning, I assembled the synth again carefully, turned it on, adjusted the knobs and yes, surely there was a sound. A weird sound of a dying whale at first but after tuning each oscillator one at a time to my Yamaha CS-15, it started to make some sense. So there we go. A synth that some corporate guy was about to throw in the trash bin was saved by an old guitar playing friend who saw the value in it and then fixed by a synth enthusiast, who’s been looking for ages for this particular synth. Sometimes fairytales DO come true. Mono/Poly sounds great especially in the monophonic mode. Really really thick bass-sounds and a lovably angry filter that squeals like a pig. There’s still three dead or lazy keys on the keyboard and a couple of the buttons that are used for picking the mode between monophonic/polyphonic/chord memory etc. take a good pushing before they work. Someday soon I’ll take it apart for a second time and fix all those things. This whole story just goes to show that some TLC is as important when fixing synths as is a bottle of CRC. Not so long time ago the exact same thing happened with my Yamaha CS-15. Oh – and we do need a 10-15 minute Youtube clip of you just tweaking it.